the last month i used the DAZ Studio 4.5 but the features from Carrara looks much better. so i would try to get a view from it. 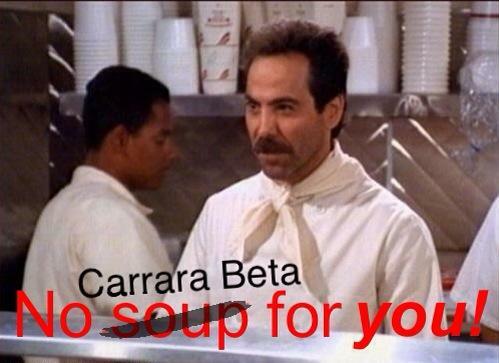 Or can only carrara user get the beta? Daniel, the beta is currently free, supposedly. Other have seen the same as you. Perhaps contact customer support? It should cost you $0.00 while in the beta stage. Someone with more knowledge of what you can do may respond soon here, as well. Wishing you luck, Daniel... you're gonna love Carrara! Regarding the Carrara 8.5 beta's price changing from $0 to $199.95 (non Platinum Club price). I would expect that if you purchase it now, you will be charged the full price, and will then need to negotiate a refund from DAZ support. I sent a PM to DAZ_bfurner last Thursday, alerting him to this situation. As yet there has been no reply. Carrara 8.5 is free for owners of Carrara 8 and 8 Pro, simply reset your downloads. If you purchase the 8.5 as you have, this is not a free purchase. Do you have Carrara 8 or 8 Pro? If so please send me your order number and I can refund this order for you. If not, you do need to purchase the 8.5. But if 8.5 is free for owners of Carrara 8 Pro, where is the serial for free ? In my account i have only the serial for Carrara 8 Pro. Okay, but i think this key expires ? The "Beta" status of this version of carrara, means that it;'s NOT a FINAL release version. it's being made available to Carrara owners to test. It's still being developed,. and it's not the final version. The serial number, and the beta version we currently have access to, are "Timed" and will eventually expire,. I'm pretty sure that the current pricing in the store is a mistake,. as no Beta software should be sold, as that's entering into a (grey) legal area between the retailer, and the rights and expectations of the paying customer. I've PM'd Daz BFurner to ask if someone from Daz3D can clarify the current situation. Is the beta going to be extended again? Carrara 8.5 Pro is free for owners of Carrara 8 Pro and not the beta. If i reset my my downloads, there is a Carrara 8.5 Pro Beta, but is 8.5.0.132 and not 8.5.0.172 ? The link to the download is dead. Anyone have news on that? ...as no Beta software should be sold, as that's entering into a (grey) legal area between the retailer, and the rights and expectations of the paying customer. I think you are a bit mistaken about this. Many companies have a practice of releasing "paid betas", for various reasons. Whether you agree with the reasons or not doesn't really matter. The customer actually agrees to pay for the right to use the software when it's in beta version. And there is no "(grey) legal area" whatsoever. There is no law against charging for betas. Nor is there a law that defines what you must describe as a beta. And just because some customers might not think it's "right" to charge for a beta version doesn't make it a "grey legal area". Companies can charge whatever and whenever they want, and the customer has no rights in the matter. If you owned a software company, and had customers who went nuts over your product, and would gladly pay for what they considered the privilege of using your software, even if it was in "beta", it might make a lot of sense for you to charge for your beta release. And there's nothing that says you can't. BTW, for those of us who are familiar with Lightwave, we're very much aware of how Newtek charged a ton of money (over $300 I recall) for people to participate in the LW 10/Core paid beta. Well, except for people like me who told them to go jump. Of course there were a lot of guys who fell for it and considered themselves lucky. Go figure. You're right Joe,. technically and legally speaking a company CAN sell any version of software which the customers are willing to enter into a financial agreement with them, to purchase,. that's one thing,... an OPEN,. Agreement that the customer will pay to use the software and provide testing feedback until the software is fully developed, at which point the Customer will receive a FULL RETAIL version of the FINAL product. That's a valid agreement,. since both parties know the TERMS, and enter into it willingly. It's completely different to asking your customers to initially "beta test software for you",. and then deciding to start charging some of them without issuing any TERMS of sale,. so right now, anyone who has paid for a beta version, has NO TERMS which means that they've paid for a BETA version, and have no entitlement or guarantee to receive a FULL retail version when it's available. Daz3D have a 30 day refund policy ,.. which in this situation ,.. is useful. Don't you think that by not having any terms to the deal,.. that it's rather grey, and by not OPENLY stating those terms of sale, that you're expecting your customers to understand clearly what they're entering into, and what they should expect for their payment. What is the customer being sold here, ? Will the customer be entitled to a final version when it's available ? Will there be an additional cost. ? If I've bought the BETA version,... where's my full serial number ? What happens when the current serial number expires. If you don't think any of this could be GREY,. ....since there are no "terms of sale". Andy, once again you’ve got me scratching my head trying to figure out what the heck you’re talking about. You made a comment about how a company shouldn’t charge for betas because of ‘grey’ legal matters, and I replied that companies DO charge for betas, and there are no legal matters involved. Now you seem to be fixed on some issues involving ‘terms of sale’ (whatever that is...), and some particular situation where a company issues a ‘free beta’, then later on decides to charge for the beta, and you then assume there are no ‘terms of sale’? I think…though I’m really not sure what you’re talking about, and where (or why) you came up with that scenario. Honestly, I’m not sure why you are so focused on ‘terms of sale’, or even what you’re referring to. DAZ, in particular, has what’s called an End User License Agreement (EULA), which describes rights and usage and stuff like that. I’m not aware of any specific ‘terms of sale’ agreements other than that, plus any specific promises a company might make for future discounts, etc. Now, if, for example, a company were to offer a ‘paid beta’ where the customer pays to receive the beta software, they might also offer those users a discount on the final release version. I’m not sure why you think there’s anything ‘grey’ involved in that, though. Those terms are usually pretty clear. But apparently you think there’s a problem with companies not telling you those ‘terms’ when betas are involved? In the case of 8.5, DAZ could, tomorrow, decide to charge for the beta, and not allow any more downloads unless you pay for it. Nothing wrong with that, is there? And along with that they could, for example, tell those who pay that they’ll get a free final release 8.5 when it’s ready. Or they might say they’d have to pay an additional fee to get the final version. Or they might say you still have to pay full price. Or they might say nothing and decide later on what to do. Nothing wrong with that, is there? Where does it say that legally that DAZ is obligated to promise anything for the future when they sell their software, beta or not? You're getting software, you paid for it, case closed. Whether it's technically classified by the company as alpha or beta or gamma or delta or whatever is meaningless. My fuzzy recollection with the Newtek example I gave was that they offered a $400 or $500 ‘membership’ which gave you access to what were actually alpha versions of software, and then said you’d get a discount on the final version. And it was stated pretty clearly. However part of what you were paying for with the $500 membership was “exclusive access” to early versions. So they could just as easily have decided that was worth the entire $500 membership, and later on charged full price to those members for the final version. Nothing ‘grey’ about that. They stated a list of benefits you get from the membership, so that’s what you paid for. No need to promise future discounts, although in this case they did. ok guys lets stick to the beta release - you had your say . if you want to say more send PM please . We've got a lot of self-proclaimed moderators here who decide they don't like what's being said so they tell people to shut up or stop beating dead horses or whatever silly things they can come up with. Compared to some of the ridiculous giggly nonsense that's posted here, what we're talking about at least has some rational information in it. The "terms of sale" is the agreement between the seller and the buyer which states exactly what both parties receive from the transaction. If there was,. I'd probably go for it,. Over the years, I've bought several products in development, but there has always been a clear agreement in writing which lays out the terms of the sale. EG: you pay me now for the beta version, ...you get the full version when it's released at no additional cost. If you have been offered this, or there's a thread I've missed announcing this offer,. then I'd appreciate a link to that. and I'll apologise for any misunderstanding. there's NO agreement that they will receive the FULL version. The End User Licence Agreement,. is an "Agreement" which lays out the Rights of the company and the customer, regarding the rights of ownership, to copy, distribute, and the general use, and limitations of use, of the product,. which the company and customer enter into,. it's an agreement of ownership and usage rights,. not a bill of sale, or the terms of sale. simply, .. there has to be an Offer, in writing, from the seller, which lays out what the customer can expect to receive if they purchase the product. If I buy the beta version of carrara right now, I have no rights to receive anything other than the beta version, as it is. that's the product for sale, and that's what the customer is paying for. nothing more. Apparently not. I have no idea what you're talking about. Okay. Can you direct me to a "terms of sale" document that's different from the EULA? If there was,. I'd probably go for it,.. I never said, or implied, that their is such an agreement. I gave a hypothetical to illustrate a point. Hence my confusion. (that's a legal agreement, and the terms of the sale). Okay, as I said, can you direct me to such an agreement from DAZ? Other than what I said, which are the EULA and any promotional offers stated in advertisements? And what does that all have to do with anything? there's NO agreement that they will receive the FULL version.. Okay, apparently you're now discussing a specific example, which I'm not discussing. In any case, why do you think DAZ is obligated to provide any agreement that they will receive the full version? .. there has to be an Offer, in writing, from the seller, which lays out what the customer can expect to receive if they purchase the product. And, once again, can you direct me to DAZ's offer that lays out this information? Edit . I found the 153 beta,but that was dated over a year ago. this is a case of not being able to see the trees for the forest,. Products are all around us and we're so accustomed to the way that they're "offered" to us for "Sale" that we no longer see it as a legal agreement, and terms of sale. ALL PRODUCTS, have three main elements which together form the "Terms of sale"
that applies whether it's a can of beans, or computer software. if you "Agree" to those terms then you enter into a legal agreement to purchase the product as described (as seen). those are the "Normal" retail circumstances. where products are expected to be "Fit for retail" and "Fit for purpose"
Under extraordinary circumstances,. the retailer can create a "Special offer" such as a Bundle of products for a reduced price. again, those three element which describe the terms of sale are still present , product image, descriptions of contents, and price. Again, these are clearly marked, and normally in a different section from the "normal" retail items. and again,... the retailer has the ability to make an offer (change the terms of sale) to allow the sale of items such as a development version, with some Discounted offer, or promise to receive the Full product when the development process is complete. If the customer is willing to enter into that agreement ,. that's their choice. as far as I'm aware,. no such offer has been made. Big H is correct and this is not the appropriate thread for a general discussion of the principles of product placement , signage, or principles of retail trade. you can PM me if you want to,. but as far as the C8.5 beta is concerned, there are NO clear terms about what the customer is purchasing (other than the current beta version) and no indication whether they would be charged more, for the "next" version of the beta, or charged more for the "full version of the beta". As such,. these Unknown factors ,.. make this a grey area,. for the customer, and the retailer. If you can clarify any of those unknown issues,... I'd appreciate it. Has the 8.5 beta been taken down? I just tried to download it from the stick link on this thread and the page cannot be found. Anyone know what's going on? if you payed for Carrara 8 then goto your account and reset C8 and the beta will there to download . Andy, I'm sorry, but that, as well as the rest of your post, is just rambling nonsense. And once again, trying to have a rational discussion with you is like trying to nail jelly to a tree. In the future, if you don't know what you're talking about, then at least admit it instead of trying to throw a bunch of unrelated nonsense at the argument and hoping something will stick.